UD atoned for is hiccup on the Hudson last week and took nothing for granted – outclassing, outscoring, and outplaying Valparaiso in every phase of the the game. 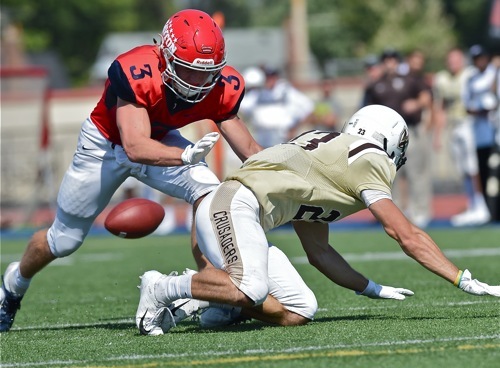 DAYTON — For the second straight week the University of Dayton football team played an opponent that had not won a game and this time the Flyers were on red alert. A week ago, they visited 0-and-3 Marist and when it ended the Flyers felt as if the other guys used brass knuckles and blackjacks as UD took a physical beating, 28-17. Just as certain as everybody knows UD coach Rick Chamberlin will roam the sidelines in khaki shorts, it was evident the Flyers wouldn’t be jumped from behind this time. 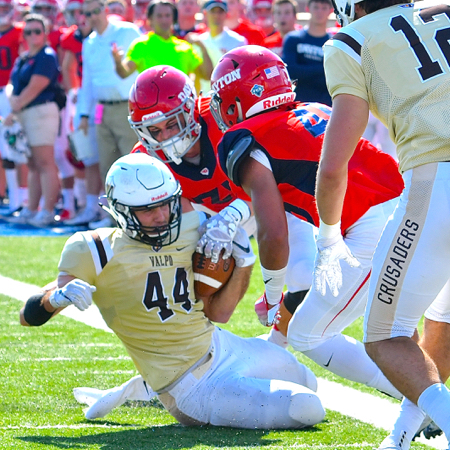 So when 0-and-4 Valparaiso showed up at Welcome Stadium Saturday afternoon the Flyers were armed and dangerous. When the pounding and pummeling was over, the Flyers owned a 53-20 victory and it wasn’t that close. When it was 37-13 at halftime, and Valpo looked more like Alpo, the Crusaders appeared ready to jump on the bus, Gus, and head on back to northern Indiana. “What was so nice about this one was that we got going early,” said Chamberlin, remembering that his Flyers fell behind early, 14-0, in their two previous games. They recovered to beat Davidson after the 14-0 deficit, but they never recovered against Marist. Against Valpo Saturday, the Flyers were 14-0 to the good 11 1/2 minutes into the game and 21-7 on the positive side early in the second quarter and piled on from there. 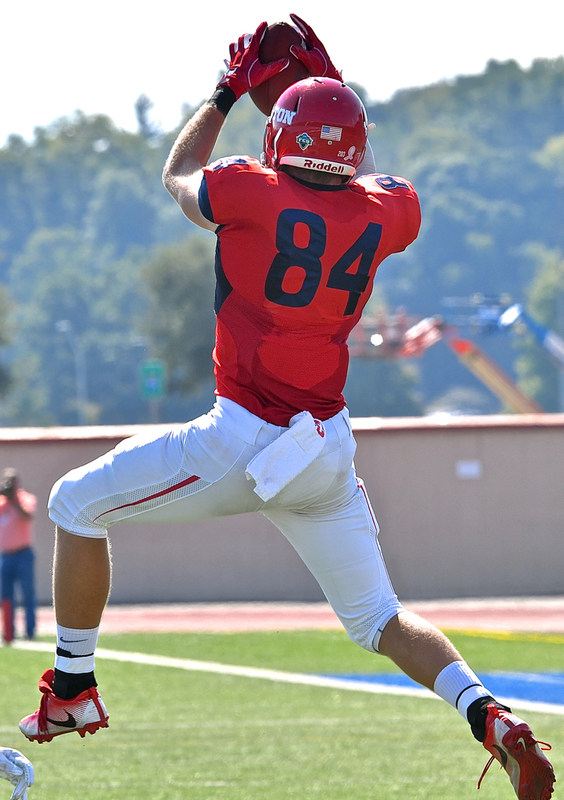 UD’s Ryan Skibinski stretches for the end zone in the first half. Talk about being armed and dangerous? On this day the Flyers were well-armed in the personage of red-shirt freshman quarterback Jack Cook, pressed into service the first week of the season when senior quarterback Alex Jeske suffered a season-ending injury. Valparaiso was intent on shutting down running back Tucker Yinger, who routinely covers 100 yards nearly every week. And the Crusaders did just that. Yinger had only 34 yards for his 13 attempts. But that enabled Cook to take the air route and he was as efficient as Aaron Rodgers on his best day. Cook completed his first 12 passes and for the day he was 19 of 22 for 292 yards and two touchdowns. And he was the Flyers leading rusher when he tucked-and-ran, five carries for 58 yards. That’s because Valpo never laid a glove on him. His offensive line, led by 275-pound senior tackle and captain Ben Gauthier, along with Nick Bart, Tim Roell, Adam Stull and Michael Niese, protected him like grandma’s china. 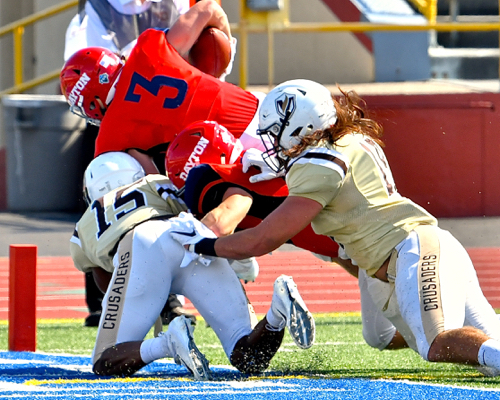 UD’s Ryan Skibinski pounces on a fumbled punt in the second half of Saturday’s win over Valparaiso. Cook spread the wealth, too. He hit tight end Adam Trautman five times. And while Valpo stuffed Yinger as a ball carrier, he slipped loose to catch four passes, including a 39-yard touchdown when he circled out of the backfield. He hit Marcus Hurd three times and Matt Tunnacliffe twice. He only connected with Kyle Butz once, but it was a 60-yard touchdown. That, though, wasn’t the only spectacular thing Butz did. Coming into the game, the 175-pound red shirt sophomore from Cincinnati Moeller, was the Pioneer Football League’s leading punt returner. And he solidified that leadership by returning a punt 51 yards for a touchdown, enacting a stop-and-jump maneuver at the Valpo 20 to shake the final defender. Butz had a punt return touchdown called back last week at Marist and there was a flag on his touchdown run Saturday, but it was against Valpo. Valpo’s Kyle Cartales’ first half touchdown was nullified by a penalty. And the Flyers have a secret weapon that other teams might miss unless they watch film very closely. Red-shirt freshman Richie Warfield, a 211-pound bruiser with speed, is UD’s No. 3 running back. But when the Flyers get into the red zone, Warfield is slipped into the game with one mission, and that’s to score touchdowns. He scored three Saturday on runs of one, four and 12 yards. That gives him 11 touchdowns in UD’s six games and he has carried the ball just 112 times. In contrast, Yinger has carried 549 times and No. 2 running back Sean Prophit has carried 106 times. Warfield’s 66 points in near the top of the PFL scoring list. Of the six top-rated quarterbacks in the PFL, five are seniors. Cook, a red-shirt freshman, went into the game as No. 3 and his Saturday performance might have shoved him to No. 1. 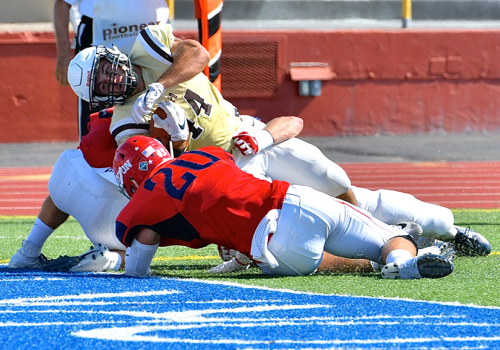 The Flyers’ defense traps Valpo running back Kyle Cartales. The game was quite the contrast to last year’s game at Valpo. The Flyers were 5-5, needing a win to prevent their second losing season in 41 years. In contrast to this year’s 37-13 halftime score, the score last year at intermission was 0-0 on a miserably cold day with a game-long driving rain. The Flyers scored early in the third quarter, but Valpo scored in the last minute and won the game by converting a two-point conversion on a Tim Tebow-ish jump pass. “A little bit different weather and I think that was a big factor,” said Butz. A little different? It was 88 degrees Saturday, much hotter on the turf, and there was not a drop of rain, just tons of drops of perspiration. The Flyers, 3-and-3 and 2-and-1 in the PFL, fly to San Diego next Saturday to play the defending champion University of San Diego Toreros, 2-and-0 so far in the league and picked by the coaches to repeat as champions. The Flyers, though, head west with some added confidence after a near-perfect afternoon Saturday. Front and back of Adam Trautman’s catch (top of page). 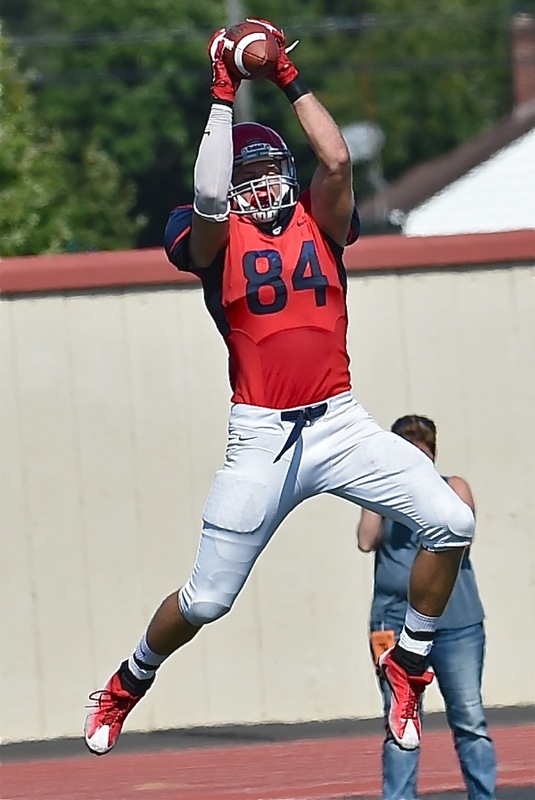 Trautman caught five passes in Saturday’s win.